The U.S. Commerce Department (including the Census Bureau). The U.S. Interior Department (including BLM Land Patents). 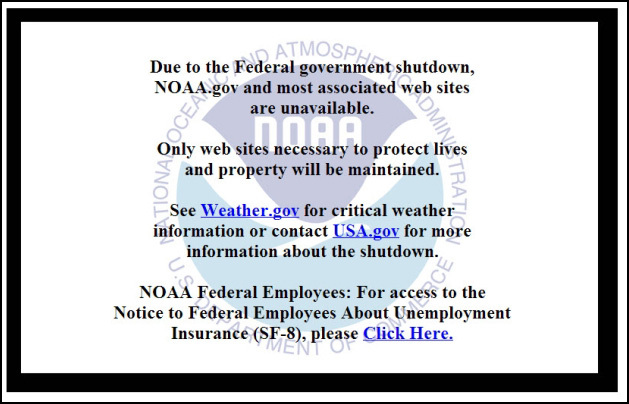 The National Oceanic & Atmospheric Administration. My two days of volunteer work are cancelled this week. Both are in federal workplaces. At least I was already unpaid. I’m surprised Congress didn’t find a way to stop the waterfall. Give it time… the geysers are sure to go, too. Such a sad, and unnecessary, state of events! All of those supposed adults running our government, and this should never have happened!!! People complain about our kids’ behavior in this day and age—I wonder where they learned it!?!?!?!?!? From a Canadian viewpoint, it seems bizarre. Not that our politics are so glorious or wonderful, but to refuse to fund government agencies? Weird. Worse – I understand the politicians will still be paid, while all those workers in forced-closed-down status will not be paid. Is that true? If so – disaster in many households I suspect. Very sad. Yes, Congress members will be paid and working stiffs will not. Sad is not the word for it. A disgrace and an insult to us all. For shame! I guess this is the same thinking that brought us a Supreme Court that found that corporations are people. Although it looks like Congress has been taken over by a bunch of unruly children. The gutting of the American Government is by design. There are many that believe the ONLY function of Federal Government should be for national defense and security. They do NOT BELIEVE in a social safety net (Social Security, Medicare, Unemployment insurance). They do not believe in Federal protection of our water, air and safety of our food our medicines They do not believe in national parks or Libraries or any of what we hold dear. In fact they believe that the federal government should keep their hands off EXCEPT when a tornado hits in their district. If it happens anywhere else it is the state’s responsibility. Now they will not come out and say that they WANT to bankrupt the country but that is their stated goal…..in order to eliminate all but the essential functions of Defense and security ( mostly of corporate assets). This is not a partisan issue it is an ideological one. We can think they are crazy. They are not. The rest of us need to wake up! the Trojan horses are put in place everywhere. Two examples. the mandate that the Postal Service fund in advance all health care benefits for years in advance. No other federal or corporate agency has such a requirement. The Medicare Drug benefit will lead to medicare insolvency and it was done without allowing the government to negotiate for reduced costs. It was boon for the drug industry and is bankrupting Medicare. There are literally thousands if these insidious seemingly innocent time bombs waiting to go explode. And if you think it was the liberals who put them in place—-think again! I am sorry for the rant but we need to stop pointing fingers and look at the fleecing that is happening before our very eyes. However we can’t see it for what it is. Not to mention the National Archives, where I like to volunteer once a week. Back pay for my friends there will literally require an act of Congress. 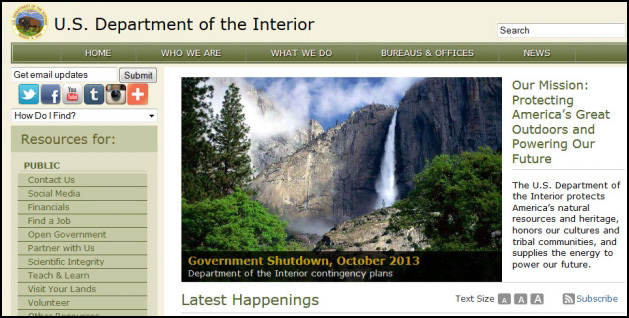 The NARA website (archives.gov) remains up and running — though it’s full of warnings about what isn’t happening. I’ll bet the Congressional “cafeteria” is open. And their jets are flying. And their limos are driving them. I don’t know this. I am guessing. Whether those are working or not, their paychecks are continuing. Someone with a web site— enlighten me. 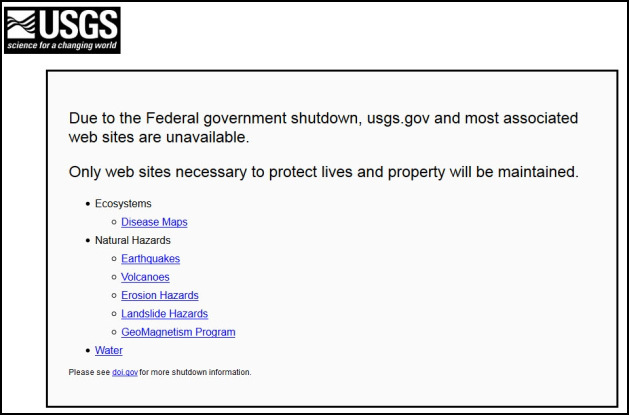 Why can’t the web sites stay open? Does someone sit there like an old telephone office plugging and unplugging cords so that we can navigate the site? Part of the issue is security: government websites are often targets for attacks (denial of service attacks, security breaches and more) and there won’t be anybody at home to keep the bad guys out of the networks if the websites are left online. Vindictiveness. Same as war memorials. On the issue of elections: A few years ago I tried an “experiment.” I casually approached several people (different ages, different incomes, etc.) on the subject of voting all legislators (who were up for the next election) out of office. (I don’t remember which patch of craziness we were going through; there have been so many!!!) Unanimously I got a resounding agreement to the idea. The kicker was that as the conversation continued, everyone started making comments along the lines of, “Well, but the legislator from my district is really a good guy. I’d vote to keep him/her in office.” My conclusion was that the people in this country don’t have the guts to stand up and throw the whole collective crew out of office. I’ve read stories in the newspaper about how negatively the Congress would be effected by “losing it’s history and continuity” and yada yada yada. Nonsense!! What we need is to wipe the slate clean and start all over again. I think these bozos should get “two terms and you’re out, no exceptions”! I apologize for my rant, as well, but somebody has to stand up and bring these things up! Throwing them all out won’t help if they have rigged the system to put others like them in anyway. Process began in 2010. Was slowed down by IRS in 2012. Perhaps will resume in 2014. It’s functional? With thousands trying to access it, barely. It appears we’re all “preaching to the choir” here. I hope all those who have commented have also contacted their congressional representatives AND the office of the Speaker of the House to express their thoughts, since it appears that, except for the fact that the Speaker refuses to allow it to come to a vote, the version of the bill that the Senate has already approved twice might actually have enough votes to pass the House and put an end to the shutdown. “it appears that, except for the fact that the Speaker refuses to allow it to come to a vote, the version of the bill that the Senate has already approved twice might actually have enough votes to pass the House and put an end to the shutdown” — I heard that last night. Blows my mind that the Republican leadership will not allow a vote just because they know they would lose. I contacted my house representative who voted against the continuing resolution. I find it laughable that we are not even talking about a budget. We’re talking about a continuing resolution. Her vote was based on defunding the health care law. I called the DC office because I think it’s more effective to politely give them an ear full. Emails just don’t get through anymore. I asked if my Texas representative understood that the state had already pulled the plug on the state risk pool? Any delay would leave me with no insurance. Thank you Rep. Kay Granger. I am missing research sites AND may not have insurance on January 1. Maybe their first vote should be to defund their own health care if there is no budget. I’m afraid this is going to go on for a while. It’s at least something we can do, Nancy, but small comfort indeed.